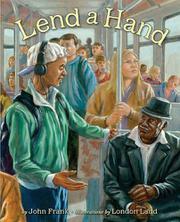 Frank and Ladd join forces to present common opportunities for children to help others. Ranging from quiet, solitary acts such as writing a letter to a soldier stationed abroad to publicly cheering for the class klutz’s first hit at bat, these 14 free-verse poems and Ladd’s richly textured accompanying acrylic-and-pastel spreads show how easy and rewarding extending oneself can be. In fact, the accessibility of Frank’s diction underscores the simplicity of the giving acts described. For example, “Sandwich” tenderly depicts a youngster’s lunchtime encounter with “the new kid / sitting alone / with only the words of a book / to feed her.” The speaker shares “half of my sandwich,” then notices that “though I had / only half for myself, / after I ate it / I somehow felt full.” Likewise, “No Charge” captures the contagious causality of being on the receiving end of a kind act: When a bike-shop attendant provides a quick tune-up for free, the young rider then passes on that courtesy by helping a woman load grocery bags into her car but refusing a tip. Ladd’s evocative illustrations lend a literal depth to the poems, helping young and pre-readers envision themselves in these situations even further.